It seems like ingredients come and go in waves of trendiness. Cupcakes. Kimchi. Bacon. Well, that one’s probably here to stay. But I do put garlic scapes in that group. This is the stem that grows out of the garlic bulb, and produces a little flower called a bulbil, that has the seeds (those are the bulbils cut off that you see on the board). 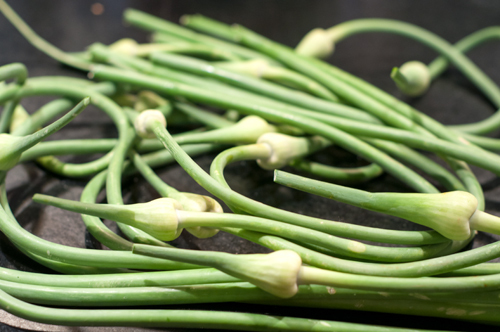 Conventional wisdom says cut off the scapes so they don’t sap the growing power from the head of garlic that is growing under the earth. I’m guessing that’s why my CSA farmer handed us all bunches of garlic scapes last week in our weekly share. And if you look up what to do with them, although there are recipes about sautéing them or using them in salads, what you’ll find is a preponderance of pesto recipes. And so into the kitchen I went to make pesto. It was simple, it was fast, and I must say, it’s quite pungent with that bite that raw garlic can deliver. I think when I use it I’ll throw it in sparingly to a pasta dish along with some basil pesto to mellow it out a bit. Or stay tuned for an upcoming post when I show you how to make salad dressing using this as the main flavoring. 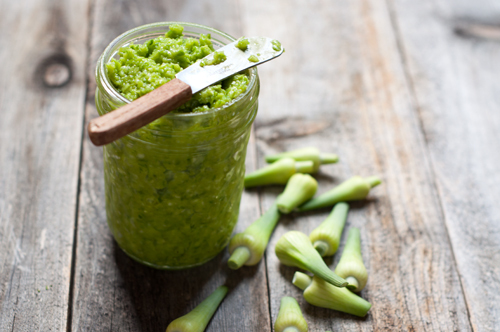 Pulse the garlic scapes in a food processor several times until they are somewhat ground up. Add the sea salt, and with the blade running, drizzle in olive oil until the mixture becomes the consistency of ketchup. You may need to stop the motor several times to clean the sides while you are working. Add the cheese and pulse just to combine. Store for up to a week in the refrigerator or freeze. 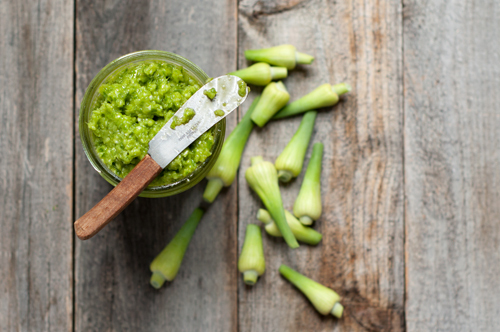 I did not use nuts in this pesto as many pesto recipes call for. You could add ¼ cup toasted pine nuts if you like for a more traditional blend.